Purchase the English graphics here and after your order is placed the Graphic Packs Dazzle will email you within 24-48 hours to request information to customize your graphics, including your preferred language. 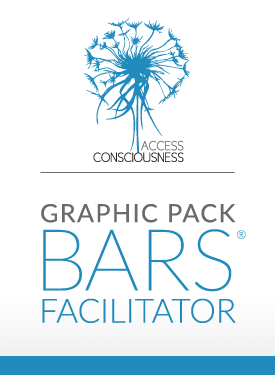 Are you ready for your Access Bars® business to expand with total ease? Are you looking for professional material to have available when people ask "What do you do?" or "What is Access Consciousness?" We're so excited to announce the brochure, business card, email signature, postcard flyer, expo banners and more are ready to go to work for YOU! The entire package is personalized just for you. You will receive the personalized files and be able to print on demand when it works for you! How does it get any easier than that? Note: These are not an instant download. After you place your order, the graphic packs team will email you within 24-48 hours to request your detailed information and customize your pack or individually purchased items. What is a Graphics Pack? A Graphics Pack is a selection of graphics as delineated below that allow you to promote your Access business, and yourself as a facilitator. Great for your back table at classes, expo booths and more... A complete pack includes your personal flyers, brochures, business cards and expo banners... they're all here for you and they even have your name on them!" You can purchase a whole pack or individual items. can be found on the Ning under the Resources tab. Need a logo for your flyers, brochures or anything else? This is the one to use! It comes personalized with your information so that people know you are certified to facilitate classes. This flyer gives people an insight into Access Consciousness® while giving you a reason to connect with them and start a conversation. How does it get any better than that? The personalized section at the back allows them to keep in touch with you! Double-sided. Personalized with your name, photo & Access Consciousness® details. Add this beautiful personalized email signature strip to the bottom of your Access business emails. Make sure the people you connect with have your details and can get in touch easily with this personalized business card! Once you place your order the Graphics Pack Team will email you to request your contact details in order to customize your graphics pack. If you would like an Access Custom URL like www.accessconsciousness.com/yourname you can purchase one HERE and have it appear on your Access Graphic Pack items. You must have purchased a public profile first in order to purchase a custom url. You can purchase a public profile if you have taken a bars class. To do so just visit your customer dashboard and under My Account click on Public Profile. What else is possible now?